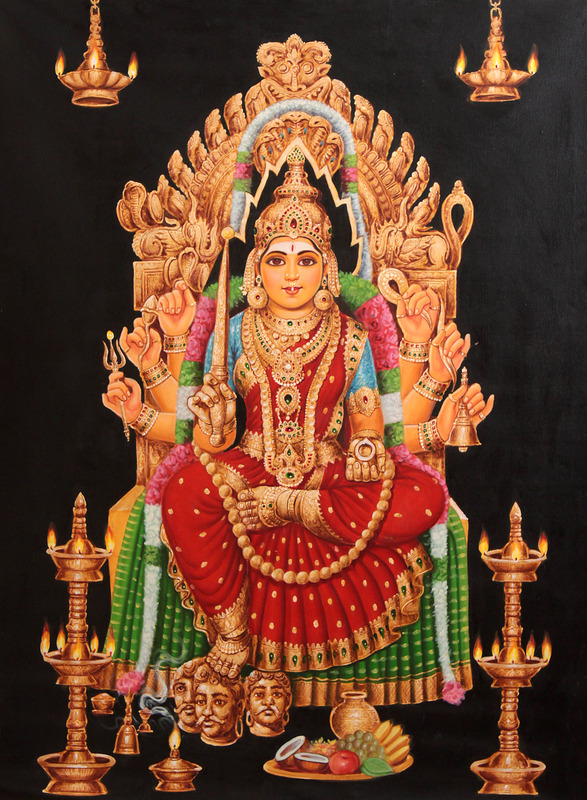 This brilliant painting, representing the eight-armed Mari-Amma, also named or spelt as Mari Amman, a South Indian version of Goddess Durga, is a unique blend of the iconic traditions of North and South : the foremost scriptural goddess of the battle-field in the North transformed into a South Indian sanctum deity. Her figure has been drawn against a deep black background, as if symbolising the divine form – cosmic light, emerging out of the formless cosmic darkness and with it emerge all forms, live or lifeless, and the entire creation. The North Indian demon-slayer Durga is invariably represented as riding her mount lion. Even her sanctum images portray her, whatever the medium, in a role, slaying a demon – usually Mahisha, or battling against them. In her South Indian transform as Mari-Amma she is alike multi-armed, usually eight, carrying in them the same attributes as Durga but she enshrines the sanctum completely in the fashion of Padmavati, the South Indian transform of Lakshmi, not Durga-like on a mount. The demon-slayer Durga, the most worshipped divinity of masses in the North, is worshipped primarily as the protector against evil. Mari-Amma, Durga in her South Indian transform, is worshipped primarily for redeeming from fever and pestilence. It is only sometimes that she is worshipped also for defeating enemies, eliminating adversities and absolving from the cycle of birth and death and freeing from the bonds of this material world. Mari Amma is the transform of Durga’s benign form and her feminine aspects. Unlike Kali’s ferocious, violent and somewhat repulsive form, Durga in her all manifestations, even when charged with great energy she slays demons in the battle-field, is the supreme model of benignity and feminine softness. One of her hands held in the blissful gesture of ‘abhaya’ – granting freedom from fear, is not only an essential aspect of Durga’s iconography but also the essence of her being. Conceived with the same benign look and feminine softness as her ante-model Durga Mari-Amma encapsulates in her being benignity and motherliness in total. This same character of the goddess reflects in her image represented here on this canvas. Seated with her right leg lying down on one of the three demon-heads, and the left, laid over the right horizontally in semi-yogasana position, the posture known in the iconographical tradition as ‘lalitasana’ – seated revealing great aesthetic beauty, represents the goddess as the model of absolute beauty and ultimate bliss. Though not represented as engaged in battle against demons, she has been conceived as carrying instruments of war and three demon-heads under her feet symbolising her evil-eliminating power. The image of the goddess has not been enshrined in a fire-arch but her seat’s back has been drawn not only with fire-arch like dimensions but is also designed with flames-like forms suggesting that she is the energy incarnate and is its perpetual source. The ‘kirtimukha’ motif that tops the seat’s back, a characteristic feature of South Indian sculptural art and iconography, is symbolic of the auspiciousness that she represents. The eight-armed goddess Mari Amma is seated in a chair overlaid with a gold-patterned green sheet, a typical South Indian textile. She is carrying in her upper right hand a serpent holding a damaru – small double drum, in its coils, in the left, a noose, in the right hand below the upper-most, a lotus, and in the left, a curved rod, in the right hand below it, a trident, and in the left, a bell, in the normal right hand, a lancelet with a rounded head, and in the left, a coconut. Her image is endowed with well defined features : a sharp nose, wagtail bird-like arched eyes, well trimmed eye-brows, elegantly shaped small lips, rounded cheeks aligning with as rounded a chin, forehead with a lamp’s flame-like looking third eye, and a round face. Resplendent as her image is, Mari Amma has been represented as wearing a gorgeous sari brilliantly coloured in red and woven with gold border and butis on the field. Her blue silk blouse too has its sleeves’ ends defined with rich gold patterns. Heavily bejeweled Mari Amma has, besides the gems studded heavy gold ornaments for ears, neck, breast, waist, arms and feet, also a splendid gold crown inlaid with rubies, emeralds, diamond among others. The crown has been styled like a Vaishnava crown, a feature common to entire divine imagery in South Indian iconography.